After the turkey is carved, enjoyed and re-enjoyed as leftovers and the remaining slices of pumpkin pie are eaten for breakfast, there always seems to be cranberry sauce still lingering from Thanksgiving in our house. 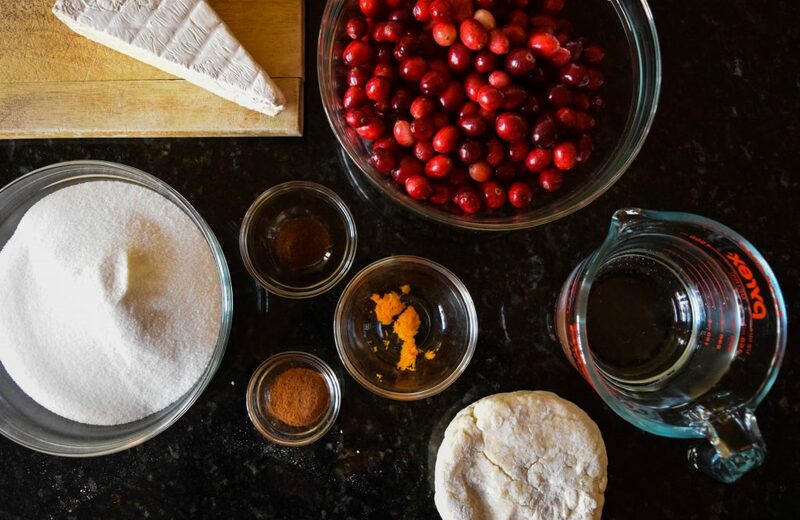 My mom’s cranberry sauce recipe makes enough to feed a small city; therefore days after Thanksgiving, we are often tasked with inventing creative uses for it and other remaining odds and ends from the holiday. 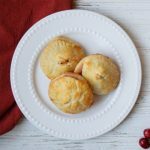 This year, I whipped up Cranberry Brie Bites using leftover sauce and brie that we had on hand from a cheese plate. 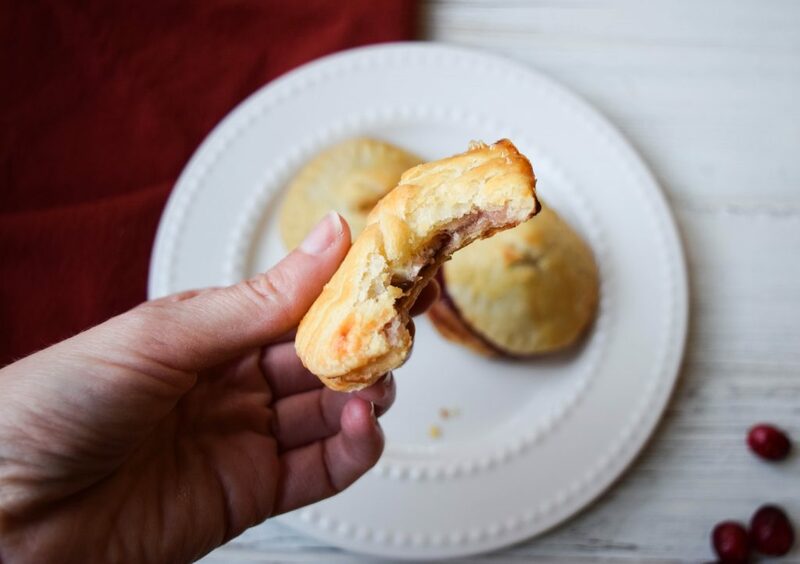 Packaged in simple pastry dough, these sweet and savory little bites are the perfect holiday-party appetizer that can be doubled or tripled depending on how much cranberry sauce you have on hand. Even if you’ve finished all your leftovers, this recipe is quick and easy to make from scratch. You can also assemble the bites and freeze them before baking to have as an emergency treat when relatives start showing up unannounced in December. To make the pastry dough, place the flour, sugar, and salt in the bowl of a food processor. Pulse to combine. Add the cubed butter and pulse, 10 – 12 times, until the butter is the size of peas. 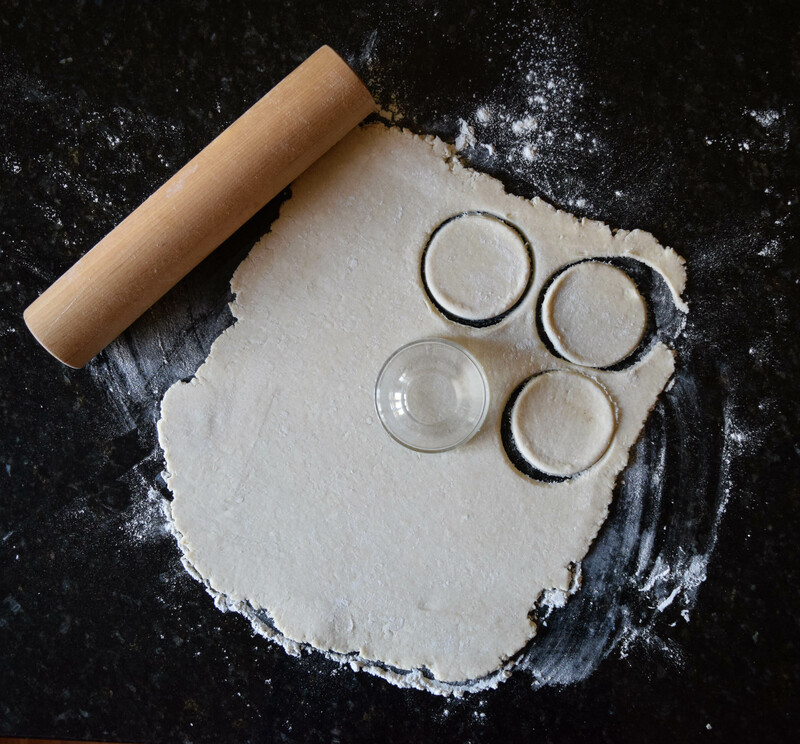 With the machine running, stream in the ice water until the dough starts to form a ball. Dump the dough out onto a floured surface and divide into two equal pieces. Form each into a disc and wrap in plastic. Store the dough in the refrigerator for at least an hour, or until ready to use. The dough can be made up to a weak in advance and stored in the refrigerator. 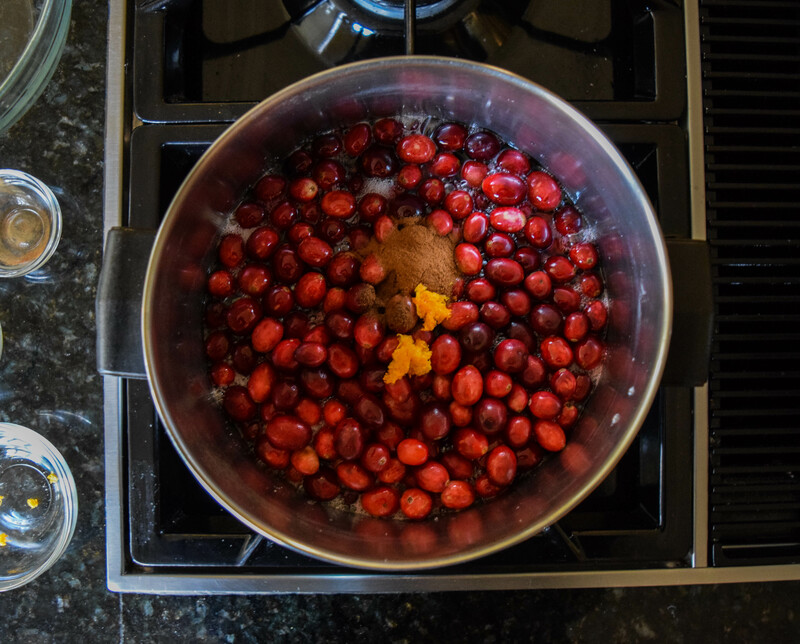 To make the cranberry sauce, place the water and sugar in a medium sauce pot over medium-high heat. Bring to a boil and stir to help the sugar dissolve. Add the cranberries, spices and orange zest to the pot and bring to a boil. Reduce the heat, so the cranberries are gently bubbling and cook for eight to ten minutes until the cranberries have popped. Mash some of the cranberries with a fork and cook for another five minutes until the sauce gels. To test if the sauce will gel, dip a cold spoon in the mixture. If you can draw a clean line through the sauce with your finger, it is ready. Cool to room temperature and then place in the fridge to cool completely. Sauce can be made up to a week in advance and stored in an airtight container in the refrigerator. 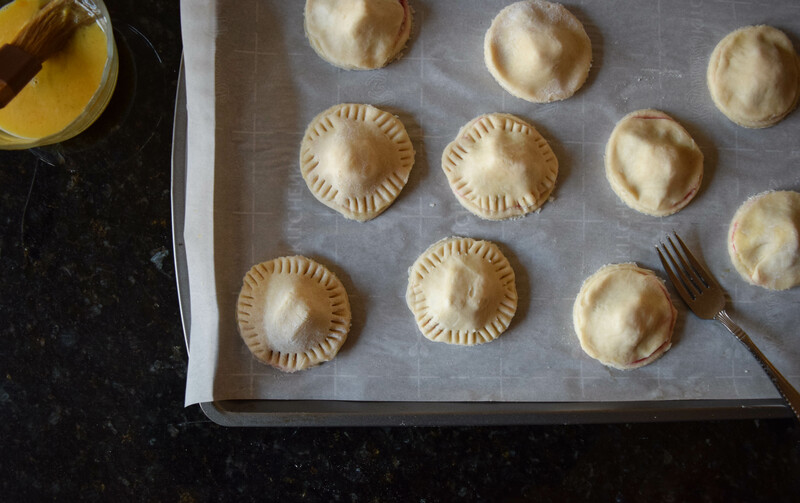 When you are ready to assemble, roll out the pie dough so that it is an eighth of an inch in thickness. Cut out one and a half to two-inch circles. Re-roll scraps and cut into more circles. Repeat with the second disc of dough. Crack your egg into a small bowl and whisk it together with one tablespoon of water to make an egg wash.
Place the dough circles on a cookie tray. Use half of the circles as bottoms for the bites. 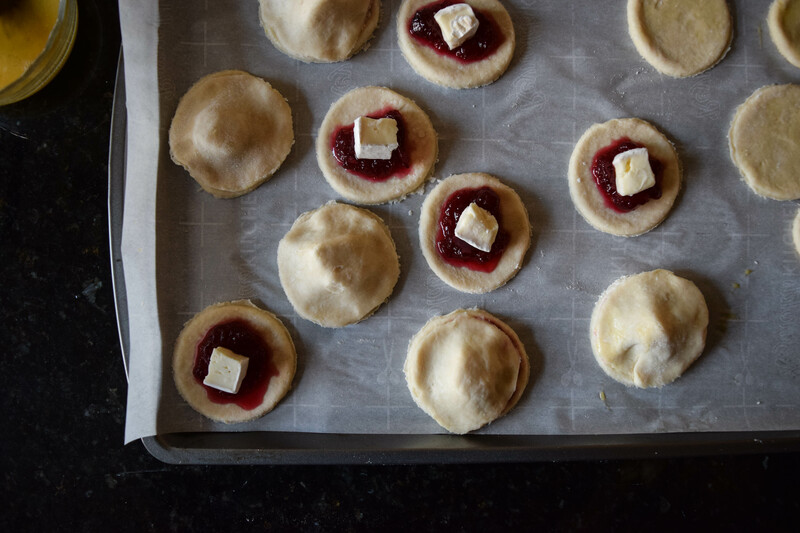 Place a teaspoon of cranberry and a cube of Brie cheese on each bottom. Brush the egg wash around the perimeter of the base. Top the cranberry and cheese with another pastry circle and gently press down to seal the edges. Repeat with the rest of the circles. Use a fork to crimp the edges and then brush the entire bite with egg wash. Transfer the cookie trays to the preheated oven and bake for 15 – 20 minutes until puffed and golden brown. Let the bites cool slightly before serving. Enjoy! 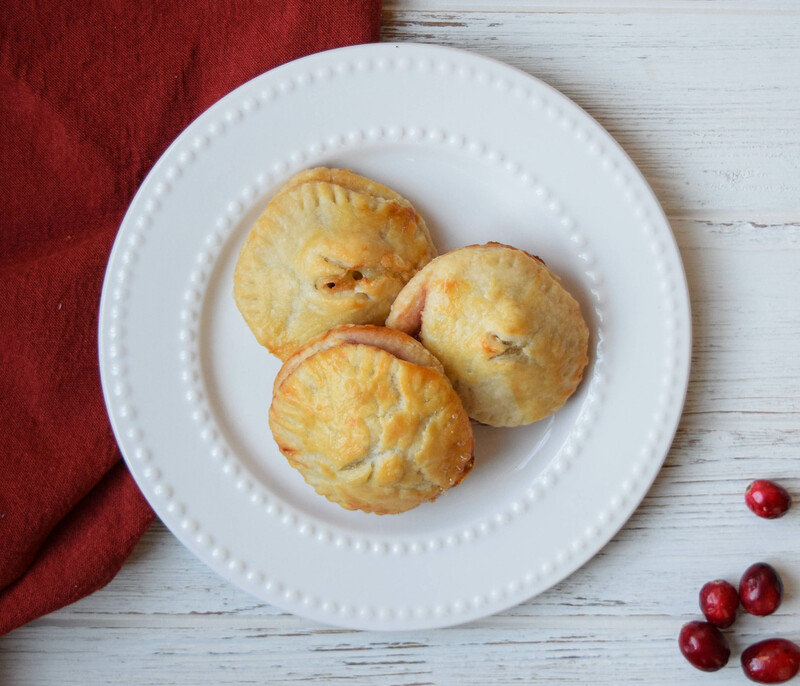 Sweet and tart, Cranberry Brie Bites are the perfect holiday-party appetizer. The recipe is quick and easy to make from scratch and can easily be doubled or tripled. You can also freeze and save for later. To make the cranberry sauce, place the water and sugar in a medium saucepot over medium-high heat. Bring to a boil and stir to help the sugar dissolve. Add the cranberries, spices and orange zest to the pot and bring to a boil. Reduce the heat, so the cranberries are gently bubbling and cook for eight to ten minutes until the cranberries have popped. Mash some of the cranberries with a fork and cook for another five minutes until the sauce gels. To test if the sauce will gel, dip a cold spoon in the mixture. If you can draw a clean line through the sauce with your finger, it is ready. Cool to room temperature and then place in the fridge to cool completely. Sauce can be made up to a week in advance and stored in an airtight container in the refrigerator.